When you’re talking with someone about a movie, one of the first questions that come to mind is “What’s your favorite character?” It’s actually pretty easy to connect over a movie role which was either smart, funny, badass, or just a good guy. However, the bond which people create thanks to their hatred towards a movie character is much stronger. Whether it’s for bad acting, being annoying, or simply meddling in a favorite character’s business, these are the 15 movie characters everybody hates. 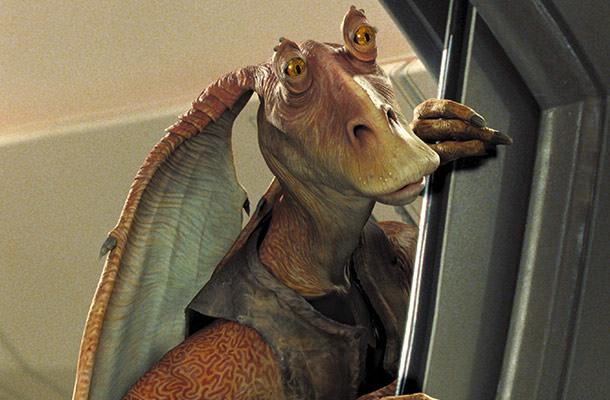 To this day, many fail to understand why people hate Jar-Jar Binks as much as they do, and there can be only one reason for this. If you watched the original “Star Wars” trilogy first and fell in love with it, you’re bound to despise Jar-Jar and everything he does and says. Jar-Jar was a big part of Episodes I, II, and III, which weren’t nearly as intense enough as the fans were already used to. If this wasn’t bad enough, the movies decided to throw in a hard-to-understand, utterly irrelevant character that’s also an offensive Jamaican stereotype. There are many things one can pin to Jar-Jar Binks, but funny isn’t one of them. In fact, people hate this guy so much that he’s been given the title of “Satan’s spawn” many a times and is the epitome of wanting to punch a movie character in the face. You need to clarify your criteria for this list, because it’s pretty dumb. Jar-Jar is hated because the character is ill-conceived and poorly executed. Ditto Sam Witwicky and the Twilight losers. Scar and several others are antagonists – they’re the villains and you hate them because they’re well-conceived and well executed to exactly that task. Putting them on the same list is stupid. I don’t know where you got your infos from, but Draco is one of the most loved HP character.